Illinois became a state December 3, 1818, the 21st state admitted to the Union. Springfield lays claim to being “Home of Abraham Lincoln” even before mentioning it is the state capital. There are plenty of Lincoln sites to see – the Lincoln family home from 1844-1861, Lincoln’s law office from 1844 till he became President, and even Lincoln’s tomb, where Mary Todd, Tad, Eddie and Willie are buried. But government is evident. 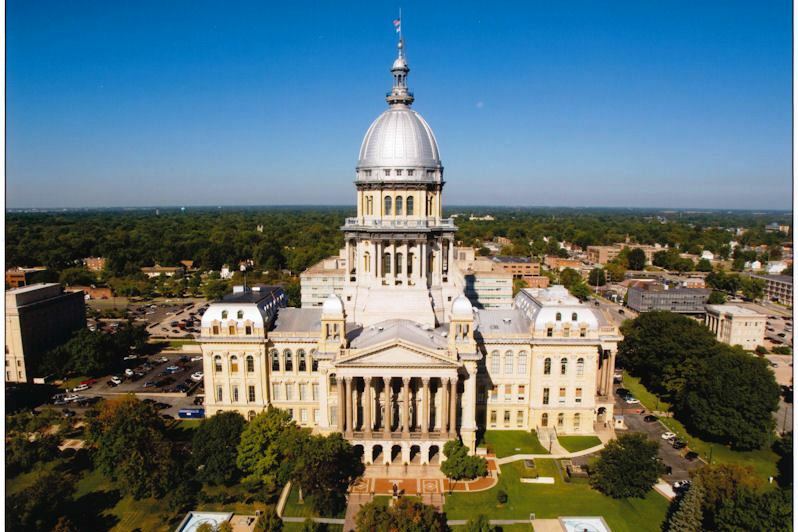 The “new” state capitol, built in 1857, is the tallest building in the city; it is 361 feet to the top of the rotunda and 405 when you add the flagpole. In the Illinois State Museum, see one of the world’s largest ice-age mastodons, as well as “Home in the Heartland,” which depicts the life of Illinois residents since the 1700’s. And for more Lincoln, New Salem is 20 miles away. The “Epcot-style” Lincoln Museum and amazing movies there; the Lincoln focus in town, his home and office open to see, the reverence inside his tomb, his bronze-bust out front, pat his nose, lightheartedly; the preserved 50’s kitsch of corn dogs and drive-ins; Route 66, heading west. Mountains near: Shawnee Hills. Charles Mound in the northern part of the state is the highest point in Illinois at 1,235 feet.